A visit to Ypres is a somber but worthwhile experience. Although the surrounding countryside is pretty and there is some historically interesting architecture in the city of Ypres, a visit is dominated by the ghost of World War I. It is there in the cemeteries that dot the countryside, in the numerous memorials, in the many small museums and historic sites as well as in everything written about the city. Yes, other things happened there but they pale in significance next to what happened in World War I.
Ypres is about an hour from the cruise port of Zeebrugge. 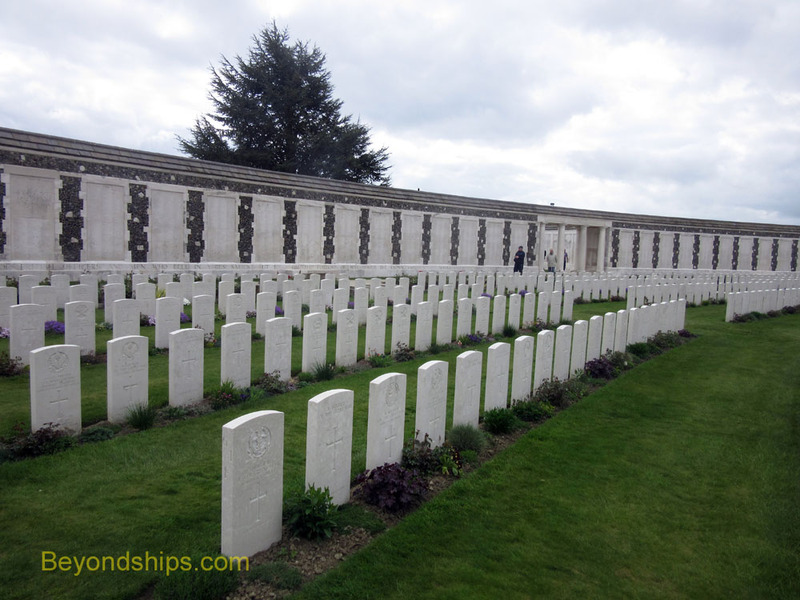 As a result, cruise ships calling at Zeebrugge sometimes have a shore excursion to Ypres, especially if there are a large number of British passenger aboard. Ypres was a center of constant fighting from October 1914 until October 1918. The fighting pitted the British Commonwealth (the United Kingdom and its overseas dominions against the forces of Imperial Germany. Although hundreds of thousands of people were killed or wounded, the towns converted to rubble and the countryside turned into a muddy wasteland, the lines moved only a few miles in either direction during the four years of fighting. In 1914, Germany invaded neutral Belgium in order to out flank France. Great Britain came to Belgium's defense but only in time to save a small area in southwest Belgium from occupation. The only sizable town in this area was the medieval city of Ypres. The Germans pushed past Ypres on either side. As a result, the area defended by the British Commonwealth projected into the German lines. It became known as the Ypres Salient. Historians divide the Ypres campaign into five battles. These included the first use of poison gas (by the Germans) and the detonation of nearly a million tons of explosives at one time (by the British). However, for the most part, the two sides faced each other in trenches divided by a “No Man's Land.” Conditions in the trenches were appalling. Boredom was broken by the terror of occasional fruitless attacks, which all too often turned into slaughters. The first stop on our tour of the Ypres area was the Tyne Cot Commonwealth War Graves Cemetery. 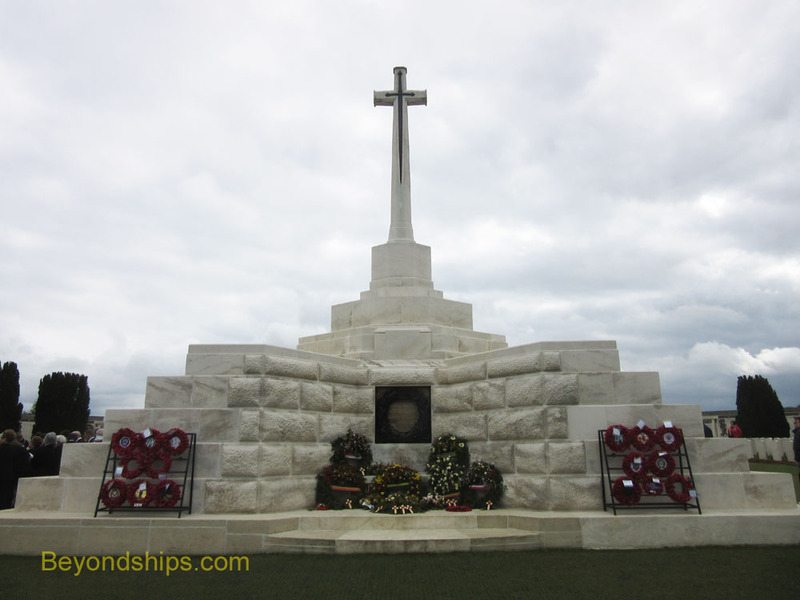 It is the largest Commonwealth forces cemetery in the world with the graves of some 12,000 Commonwealth soldiers including 8,900 from the U.K., 1.300 Australians, nearly one thousand Canadians, 500 from New Zealand and smaller numbers from several other countries. Located a few miles from the city of Ypres, the ground the cemetery is on was fought over in the Battle of Passchendeale (also called the Third Battle of Ypres). An Allied offensive fought in 1917, the primary objectives were to secure the Belgian coast thus depriving the Germans of bases for their U-boats and to connect to the Dutch frontier by capturing Passchendale Ridge. In the end, little was accomplished leading British Prime Minister Lloyd George to call the battle one of the “greatest disasters of the war” and a “senseless campaign.” The cost was nearly a quarter million British dead and 215,000 German dead. Above: At the suggestion of King George V, a Cross of Sacrifice was erected atop the German blockhouse that sits at the center of Tyne Cot Cemetery. Below: The Tyne Cot Memorial to the Missing is a stone wall in back of the graves. The cemetery is on a rise overlooking relatively flat farmland. As such, it was strategically important because observers on the rise could see movements on the flatlands below and direct artillery fire. Australian and New Zealand troops captured it in October 1917 but the Germans re-captured it six months later. Very little looks the way it did during the war. The only structure left from the battle is a German blockhouse, which sits amidst the precise lines of grave markers. Grass has replaced the endless mud, which was a hallmark of the Ypres campaign. When we were there, a choral society from the British Isles gathered around the blockhouse and sang hymns and period songs. Tourists climbed atop the blockhoouse for a better view. Behind the graves is a stone wall that is The Tyne Cot Memorial to the Missing. On it are written the names of 33,783 Commonwealth soldiers missing in action. Originally, these names were to be inscribed on the Menin Gate memorial (discussed below) but it tuned out that there were more names than could fit there so those who died after August 16, 1917 are listed here. The Memorial, designed by Sir Herbert Baker, has classical features with Victorian/Edwardian overtones. The feel is heavy, sober and mournful for the thousands who lost everything but their name.